Complications Related to the Access-port in 435 Cases of Laparoscopic Adjustable Gastric Binding. Objective: To establish the frequency and nature of complications related to the access-port in patients who underwent Laparoscopic Adjustable Gastric banding (Allergan, Inc., Irvine, CA). Methods: We reviewed the medical records of 435 patients who underwent laparoscopic adjustable gastric banding in our institution to ascertain the complications related to the access-port. The complications data were collected both by hospital readmission and reoperations as well as prospective collection of data in surgeon’s office as COE (Centers of excellence) requirement. 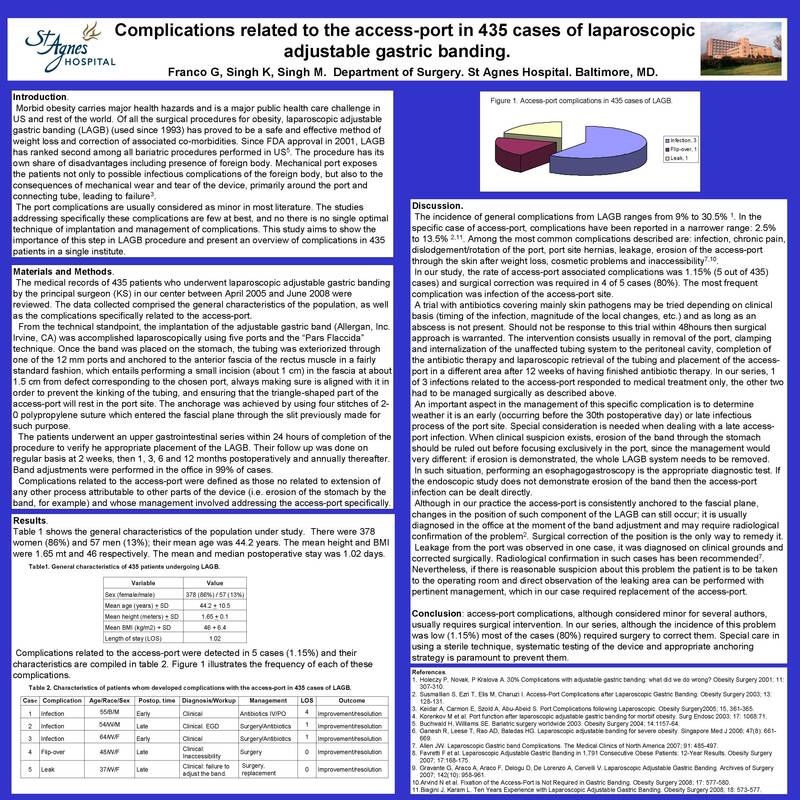 Results: from April 2005 to June 2008, the rate of complications related to the access-port occurred in 1.4%, corresponding to 6 cases. Those included: infection requiring removal of the port and subsequent re-placement in a different area: 3 cases (0.7%); infection which responded to medical treatment, 1 case (0.2%); port flip over, 1 case (0.2%) and leak around the port, 1 case (0.2%). Conclusion: In our experience, complications related to the access-port are not as frequent as compared with published studies, but in most of cases (83%) required surgical intervention. Efforts should always be made to achieve a sterile technique and appropriate anchoring to the fascial plane in order to prevent them efficiently.